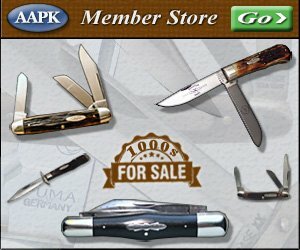 This page is an index of sorts that contains links to all of the content AAPK has available on Remington knives. You will find information about the company’s history, places to buy & sell, places to discuss, ways to identify a Remington knife’s age & much more. Dig in & get to surfing! To read about the storied evolution of the great Remington cutlery company & the knives created there, visit our Remington Knife history page. Be sure to stop by our store & shop for Remington pocket knives if you might like to add some great knives to your collection! Remington’s Numbering System This link will explain the numbering system that Remington uses to represent different handle materials and other characteristics about its knives. Remington Tang Stamps Here you will find the various tang stamps used by Remington, along with what they will tell you about their knives. Remington Pocketknife Shields This link will explain and illustrate some of the more popular shields that have been used by Remington. Remington Knife Patterns This link shows some of Remington’s knife patterns listed by their factory pattern numbers. You will find pictures, names, and description. Remington Bullet Knives This link is dedicated to Remington’s most popular knives. Here you will find detailed information about the bullet knives. Handle Materials used by Remington Here you will find some pictures and descriptions of the various handle materials that Remington used. They are listed by their respective handle number designation. Blades and blade material used by Remington Here you will find pictures of the various blades that are used on Remington knives along with the various materials that they are made of. Remington Knife Forum Here you will find a forum dedicated to Remington knives. This is a great place to ask questions, share your knowledge or just talk anything & everything Remington related. Remington Image Gallery If you like to look at cool old knives, we have a gallery for that. This link is a portal to our Remington knife specific image gallery. It’s not just a great place to look, you can also upload pictures of Remington knives you might like to show off. We especially like to see rare old vintage examples.